Robert Luff & Co are delighted to offer for sale this extended semi-detached house being situated in the sought after location of Goring-by-Sea with sea, shops, schools, bus routes and mainling railway station serving London, Portsmouth, Southampton and Brighton, all nearby. The versatile accommodation lends itself to lots of lifestyles and has in brief, six bedrooms, three reception rooms, kitchen, cloakroom/w.c, utility room, two bath/shower/w.c's and ample parking and garage store. The property is being sold with no forward chain and must be viewed to be appreciated. Wall mounted timer control unit for central heating, smooth ceiling, smoke detector, picture rail, radiator, telephone point. Close coupled low-level w.c, wash hand basin, radiator, smooth ceiling. Double glazed and brick construction with pitched roof, radiator, tiled floor, TV point, double glazed double doors to rear garden. Measurements to include built in units. Matching range of floor and wall units with work top surfaces and inset one and half single drainer sink unit with mixer tap, built in dishwasher, oven, hob and extractor, radiator, part tiled walls, double glazed window, smooth ceiling with spotlights. Accessed from the side pathway of house via door. Sink unit, plumbing and space for washing machine and space for two further appliances under work top, wall mounted gas fired central heating boiler, wall mounted cupboards. This forms part of the original garage area. Double glazed window, picture rail, smooth ceiling, radiator. 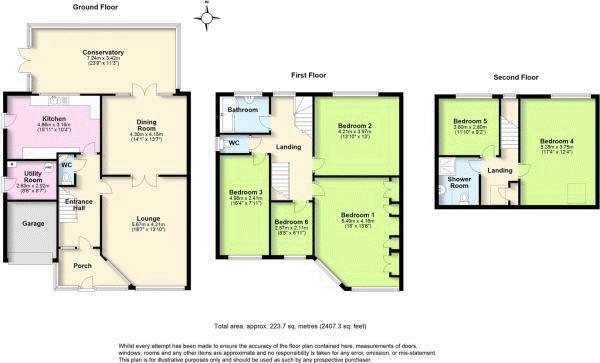 Narrowing in one corner and to include range of fitted wardrobes and drawers, TV point, radiator, double glazed window, picture rail, smooth ceiling with spotlights. Double glazed window, picture rail, radiator, smooth ceiling. Double glazed window, radiator, smooth and coved ceiling. Double glazed window, raidtaor, smooth and coved ceiling, laminate flooring. P shaped bath with wall mounted shower and screen, pedestal wash hand basin, obscured double glazed window, tiled walls, large heated towel rail, smooth and coved ceiling. High level w.c, radiator, obscured double glazed window, part tiled walls. Velux and double glazed window, smooth ceiling, smoke detector, linen cupboard and access into eaves loft space and storage. Slight head restriction to one wall, radiator, smooth ceiling, double glazed window and velux and giving double aspect and views to the rear over roof tops towards the South Downs, TV point. Double glazed window, radiator, smooth ceiling, views to the rear over roof tops towards the South Downs. Step in double corner shower with wall mounted shower, pedestal wash hand basin, low-level w.c, velux window, electric shaver point, radiator. Mainly laid to brick paved driveway for numerous vehicles, side access, hedge and trees, flower border. Gas and electric meter, electric circuit board fuse box, up and over door, racking units. Laid to lawn, flower and shrub borders, patio areas, shed and summerhouse, enclosed by fencing.